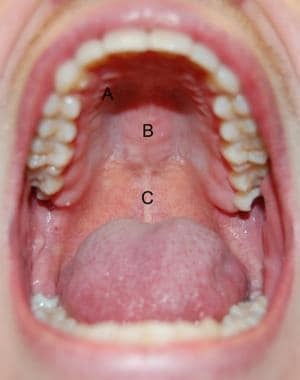 The velum is prolonged by a median free process termed the uvula and 2 bilateral processes termed the palatoglossal and palatopharyngeal arches or pillars, which join the soft palate to the tongue and pharynx, respectively. 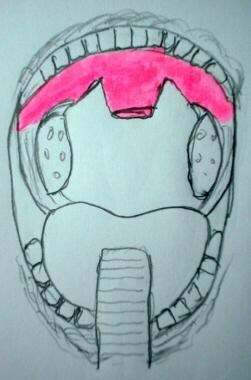 The fauces represent the space between the cavity of the mouth and the oropharynx. They are bounded superiorly by the soft palate, inferiorly by the root of the tongue, and laterally by the pillars of the fauces. For more information about the relevant anatomy, see Mouth Anatomy and Pharynx Anatomy. Patient education and counseling is essential before laser-assisted uvulopalatoplasty. The procedure should be fully explained to the patient and informed consent should be obtained. Patients should be advised to develop a regular sleeping pattern and avoid sleeping in the supine position. Patients should avoid alcohol and tobacco, lose weight, and treat any gastroesophageal reflux disease. Prior to laser-assisted uvulopalatoplasty, a complete history of sleep problems should be obtained from the patient and family members. Medical history should be taken and a detailed medical examination, including vital signs and body mass index, should be performed. A full head-and-neck evaluation is indicated, including tongue base size, uvula and palate assessment, and gag reflex. A fiberoptic endoscopic examination should be conducted for assessment of the nasal airway, nasopharynx/velopharynx, tongue base, pharyngeal walls, and larynx/hypopharynx. The Muller maneuver should be performed during flexible endoscopy. The level at which snoring is generated can be assessed using the Muller maneuver. In this technique, the upper airway is visualized using a flexible nasendoscope when the patient attempts a forced inspiratory effort against a closed nose and mouth. The procedure is repeated with the nasendoscope in the postnasal space to assess the velopharyngeal sphincter. The degree of collapse at different levels within the pharynx is reported to correlate with the site of obstruction causing the snoring. Diagnostic tests should include overnight pulse oximetry and complete diagnostic polysomnogram. Radiological studies are usually not required before laser-assisted uvulopalatoplasty. SwiftLase (Sharplan Lasers) is a laser flash-scanner used in laser-assisted uvulopalatoplasty. It moves the beam rapidly over the tissue, allowing for thermal relaxation and decreased heat buildup in the tissues. SwiftLase produces less char and therefore less granulation tissue, which results in faster healing. It also allows for precise layer-by-layer surface ablation and the ability to seal small vessels. Laser-assisted uvulopalatoplasty is performed under local anesthesia, with 10% lidocaine spray applied to the palate and the base of tongue regions. Injection of 1% lidocaine with 1:100,000 epinephrine mixed in equal parts with 0.5% bupivicaine is used for infiltration into the treatment area. The entire uvula, including its base within the soft palate, is injected (see the image below). The soft palate is injected on each side, 1 cm above free edge and the midway between the midline and the level of the medial aspect of the tonsillar pillars. Points of injection for local anesthetic solution. In patient with severe gag reflexes, 1 mL of anesthetic is injected into the posterior tonsillar pillar, to anesthetize the glossopharyngeal nerve and to reduce the gag reflex. Surgery is started 10 minutes after infiltration. Laser-assisted uvulopalatoplasty is performed in an upright, sitting position in an otolaryngology examination chair. Postoperative monitoring includes vital signs and observation for 20-30 minutes. Antibiotics are prescribed for 1 week, with analgesics and/or anesthetic lozenges as needed. A soft diet is recommended for several days. The patient should be reevaluated in 4-6 weeks to assess the effect of the procedure. After diminishing snoring, a polysomnogram should be performed in patients treated for obstructive sleep apnea. Sleep laboratory studies should be repeated 3 months after the procedure. The surgical goal is to reduce the length and reshape the palate and uvula. Kamami originally described the standard laser-assisted uvulopalatoplasty technique, in which a bilateral vertical 1 cm transpalatal incision is made each time; this is followed by partial vaporization of uvula. This is a multistage office procedure that requires a carbon dioxide laser, but does not need a new handpiece for each treatment. Over time, Kamami began performing a one-step procedure. All personnel and the patient wear CO2 laser safety goggles. A special pharyngeal handpiece with backstop is used to incise the soft palate. The laser power setting is 18-20 W in the continuous mode. Vertical trenches created on either side of the uvula using a carbon dioxide laser. Shortening and thinning of the uvula is done by using the SwiftLase flash scanner attached to the CO2 laser, using 18-20 W power. 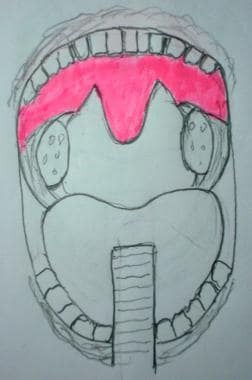 The uvula is shortened by ablating the muscle from within, creating a fish-mouth appearance, because the mucosae of the base of the uvula on the nasal surface and oral surface are preserved. The uvula is reduced to 60-90% of its original dimensions by coring it out from the bottom up. 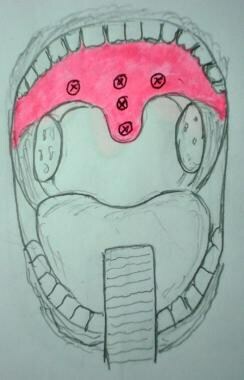 The residual uvula base will now have the appearance of a “neouvula" (see the image below). Camacho M, Nesbitt NB, Lambert E, Song SA, Chang ET, Liu SY, et al. Laser-Assisted Uvulopalatoplasty for Obstructive Sleep Apnea: A Systematic Review and Meta-Analysis. Sleep. 2017 Mar 1. 40 (3):[Medline]. Kamami YV. Laser CO2 for snoring. Preliminary results. Acta Otorhinolaryngol Belg. 1990. 44(4):451-6. [Medline]. Göktas Ö, Solmaz M, Göktas G, Olze H. Long-term results in obstructive sleep apnea syndrome (OSAS) after laser-assisted uvulopalatoplasty (LAUP). PLoS One. 2014. 9(6):e100211. [Medline]. [Full Text]. Coleman JA Jr. Laser-assisted uvulopalatoplasty: long-term results with a treatment for snoring. Ear Nose Throat J. 1998 Jan. 77(1):22-4, 26-9, 32-4. [Medline]. Krespi YP, Keidar A. Laser-assisted uvulopalatoplasty for treatment of snoring. Operative Techniques in Otolaryngology Head and Neck Surgery. 1994. 5:228-234. Krespi YP, Ling EH. Laser-assisted serial tonsillectomy. J Otolaryngol. 1994 Oct. 23(5):325-7. [Medline]. Littlefield PD, Mair EA. Snoring surgery: which one is best for you?. Ear Nose Throat J. 1999 Nov. 78(11):861-5, 868-70. [Medline]. Woodson BT, Tadokoro KS, MacKay SG. Radiofrequency ablation of the lateral palatal space for snoring. World J Otorhinolaryngol Head Neck Surg. 2017 Jun. 3 (2):106-109. [Medline]. [Full Text]. Krespi YP, Kacker A. Laser-assisted uvulopalatoplasty revisited. Otolaryngol Clin North Am. 2003 Jun. 36(3):495-500. [Medline]. Walker RP. Laser uvulopalatoplasty: Techniques and results. Operative Techniques in Otolaryngology Head and Neck Surgery. 2000. 11:2-6. Weaver TE, Calik MW, Farabi SS, Fink AM, Galang-Boquiren MT, Kapella MC, et al. Innovative treatments for adults with obstructive sleep apnea. Nat Sci Sleep. 2014. 6:137-47. [Medline]. [Full Text]. Yaremchuk K. Palatal Procedures for Obstructive Sleep Apnea. Otolaryngol Clin North Am. 2016 Dec. 49 (6):1383-1397. [Medline]. Trotter MI, D'Souza AR, Morgan DW. Simple snoring: current practice. J Laryngol Otol. 2003 Mar. 117(3):164-8. [Medline]. Goode RL. Success and failure in treatment of sleep apnea patients. Otolaryngol Clin North Am. 2007 Aug. 40(4):891-901. [Medline]. Lauretano AM. Uvulopalatoplasty using laser-assisted techniques. Operative Techniques in Otolaryngology Head and Neck Surgery. 2000. 11:7-11.